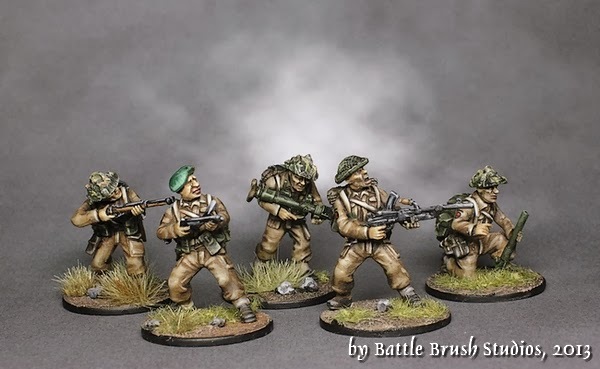 Battle Brush Studios: Review: Commandos! 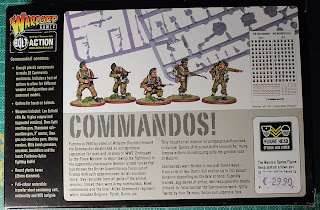 Going on with WW2 month, here's a review of an all plastics kit from Warlord Games - it's Commandos! 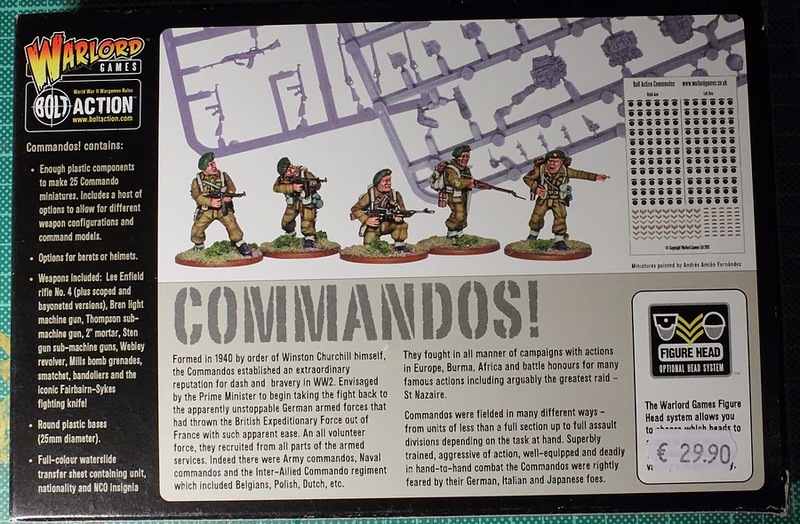 Usually I'm all for the regular grunts but this time I went for fancy and grabbed me a box of Warlord Games' Commandos plastic set when looking through the shelves at my friendly local gaming store (Damage Unlimited. Visit it if you're in Vienna, Austria). Alright who were the Commandos? In 1940, Winston Churchill demanded a special service force to carry out raids against German-occupied Europe. 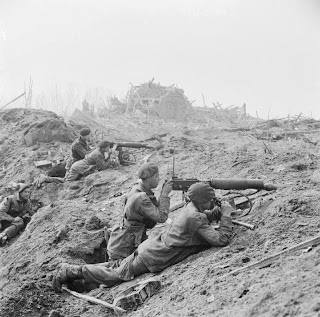 The men were volunteers from all branches of the British armed forces and foreign volunteers from all across Europe. They received additional training (usually directly in regards to the upcoming mission), specialists were picked out and instructed in the use of explosives and the likes. The whole troop carried out quick and lengthily planned-out raids against strategically important points, usually at night. 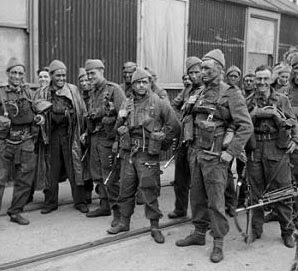 That aside, the Commandos had an important job in boosting British morale and many raids had less of a strategic value rather than keeping the idea of having an impact on what happens on the continent as well as building up a reputation for the Commandos. 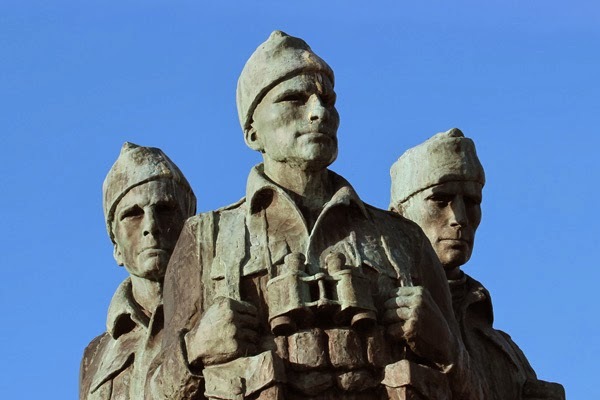 By October 1943 the Commandos had become so infamous that Hitler issued the Commando Order in which he instructed to have any captured Commando soldier killed outright. During and after the Nordmandy landings the Commandos' tasks increasinly changed to assault infantry and reconnaissance. Now let's look at the box first. 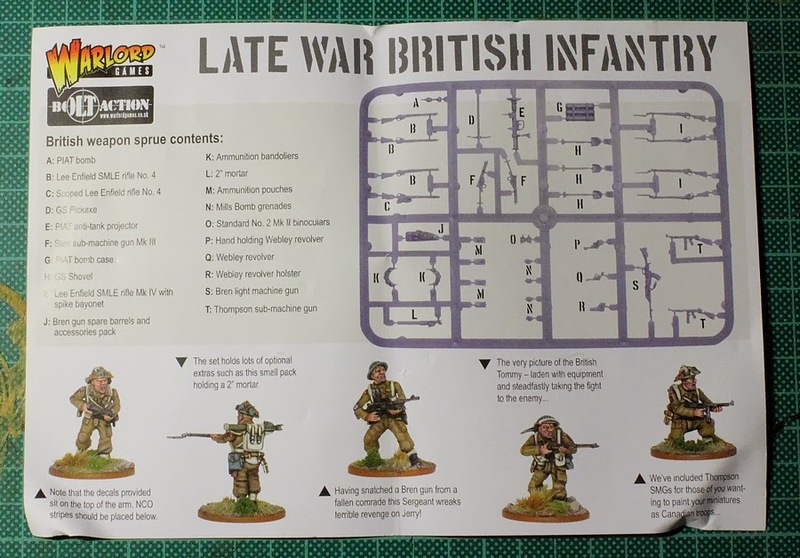 As with all of Warlord Games' boxed infantry sets we get the title, artwork in the back and two to three guys more closely in the right. The artwork shows a coastal raid at dusk (I assume). Solid, as always. The box also lets us know that there are 25 models in there. No surprises there either. To the left, more information on what's in the box along with some historical information in the middle and some pictures of built and painted models. Now for the goodies - what's in the box? First, as always, the info leaflet which doubles as a listing and description of what part is supposed to be what. Very handy. 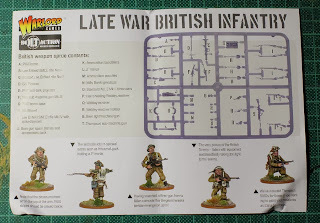 But wait, this one says Late War British Infantry on it? Yup, Warlord Games' have been clever again. 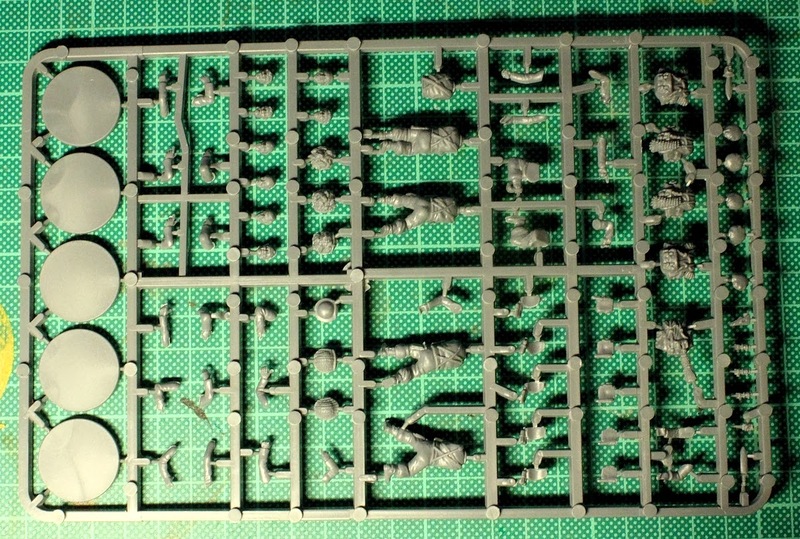 Instead of making an all new sprue for Commandos (which really are a niche thing), they recut the Late War British Infantry sprue. 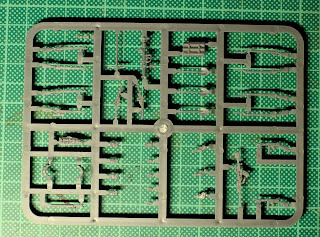 So this is the sprue you actually get in this box (fivefold). 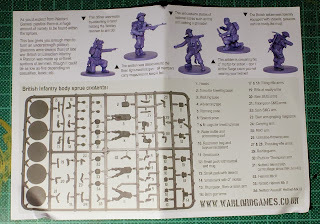 The differences to the Late War Infantry Sprue is that they replaced the infantry backpacks with extra large commando ones. They also saved some space on this so they could add some more stuff: five berets some hands with knives and sheathed knives. Knives on Commandos are a big deal. 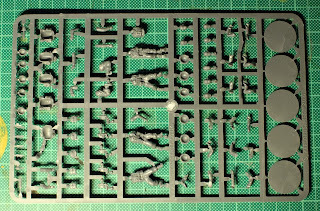 That detail aside, we get five bodies per sprue (one standing with a little movement to it so it doesn't look unnatural, two advancing, one standing as if firing or throwing a grenade and one kneeling). The poses are a bit less dynamic and varied than on the early war German infantry. 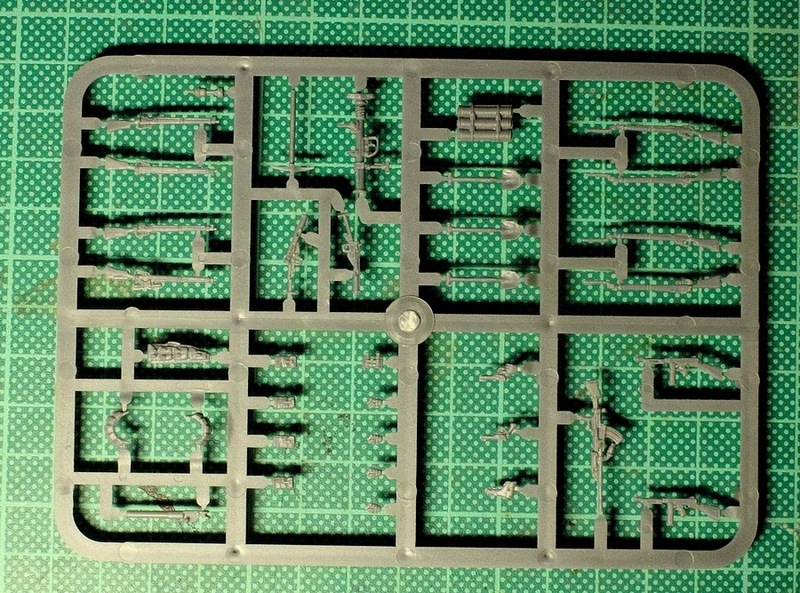 There are also eight heads on the sprue for some variation, six helmets, 10 arm pairs for various weapons, additional pockets, canteens and five round, flat 25mm diameter plastic bases. At this point I would like to commend Warlord Games again on the characterful faces they make in plastic. They aren't super-realistic but they are really characterful and interesting. 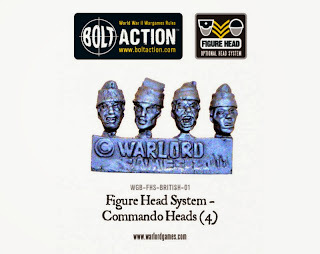 A downside I noticed about the sprue is the lack of comforter hats which turned into the Commandos' favourite pieces of headgear (especially on raids) for being comfortable to wear, light weight, non-reflective and warm. Even the Commando Memorial statues wear them! 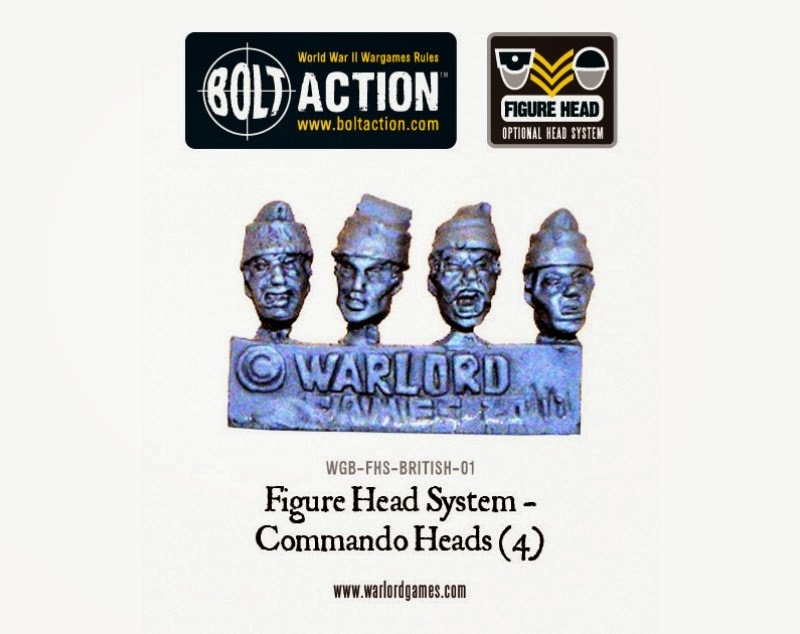 Well, this was noticed by many people it seems because shortly after the release of the plastic Commandos box, Warlord Games adressed this and released sprues with metal Commando heads with cap comforters. Would have been nice to see those in the box though. You can buy a pack of 4 of those heads for £2.50 or a pack of 24 for £12.50. 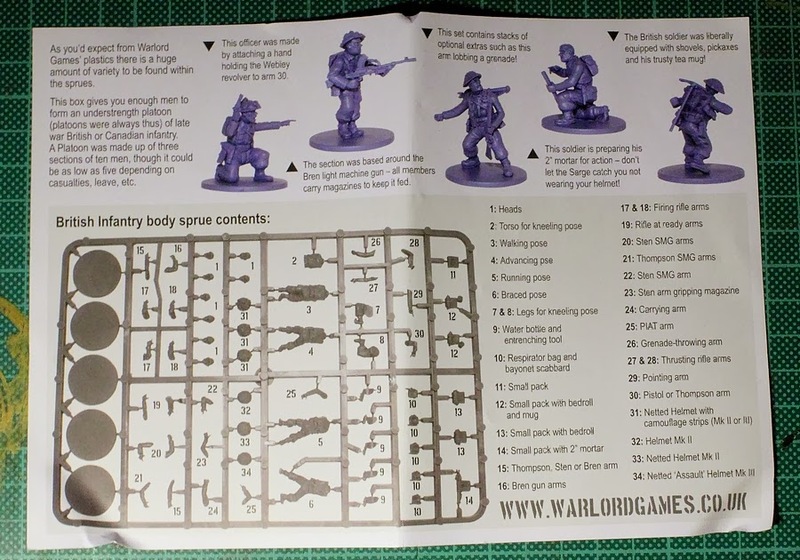 I get why they wanted to have enough berets for everybody on those sprues because the green berets is their thing but when Warlord Games recut the sprue maybe they could have found a spot somewhere to put a comforter cap on there as well. 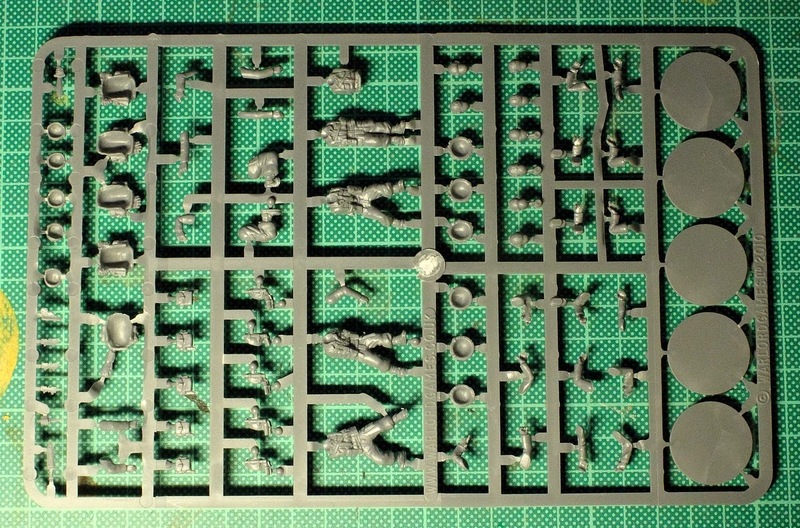 Three copies of this sprue are to be found in the box and they are exactly the same as in the Late War Infantry box. As you can see, it has all the weapons you will need: Eight Lee Enfield rifles (four of which with bayonets, one of the other four with scope), a Bren Gun, a PIAT launcher (anti-tank launcher), a bunch of hand grenades, a 2" mortar, some ammo pouches, a pickaxe, four shovels, two Webley revolvers, a revolver holster, two Sten guns (SMG) and two Thompson sub-machine guns. Sufficient in terms of arnament I would say. Commando troops were usually equipped to fit the mission so you're not too tied down as to who'd get what kind of weapon. Commandos naturally did like sub-machine guns on raids. At times Commando units would be issued some more funky stuff like the De Lisle Carbine which had an integrated silencer and to this day possibly is the most silent firearm ever manufactured! 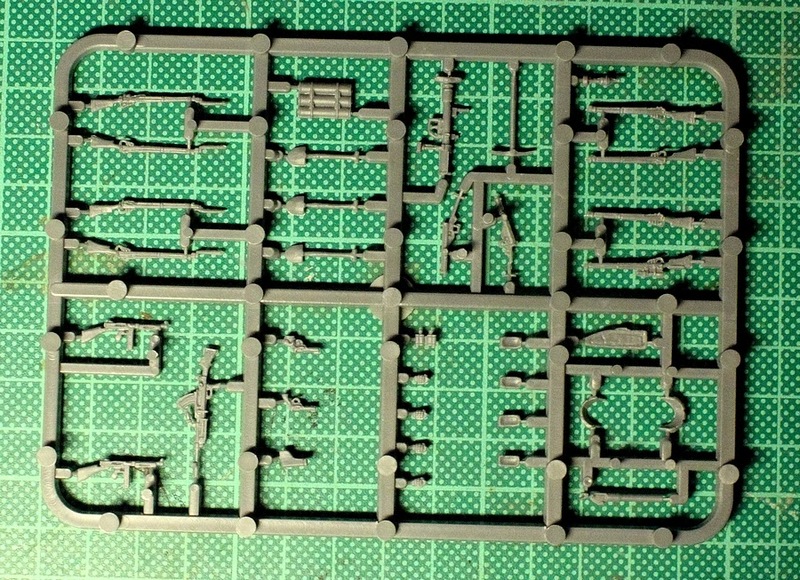 Of course this is not on the weapons sprue but I think you can rather easily convert it by cutting off the front bit from one of the Lee Enfield rifles, add an ammo magazine in front of the trigger and there you go. Anyway, back to the set. What's also in the box is a decal sheet! It's got the formation badges and rank insignia for the fellas' sleeves. Pretty neat. So I built ten of the guys. 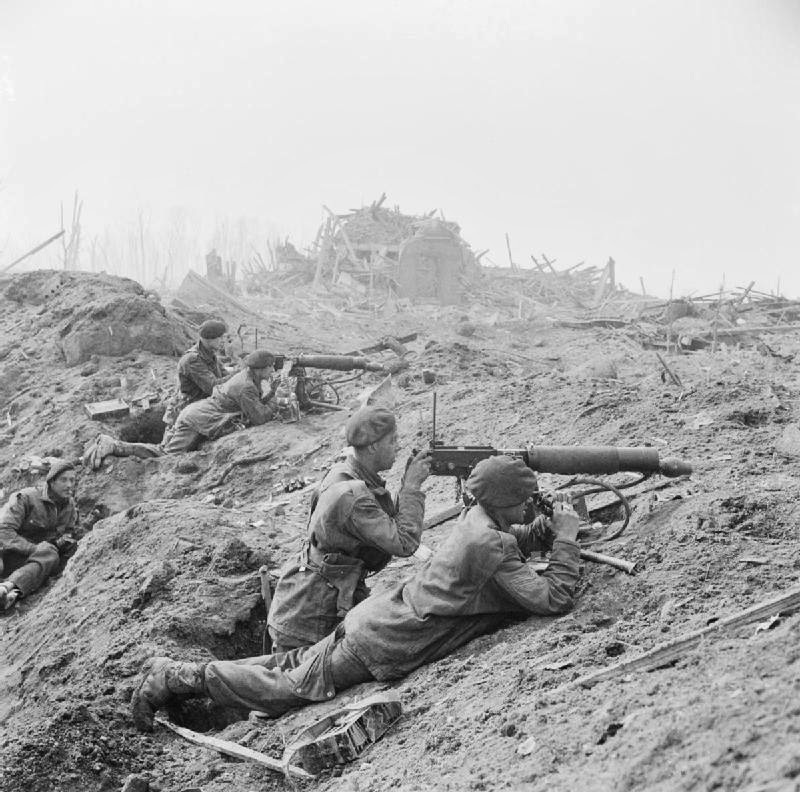 One Sergeant, two Bren gunners, a few guys with sub-machine guns, some with rifles and so on. Most of them are wearing helmets because these are mainly meant to represent Commandos a forward scouting patrol so more standard issue equipment, but still the extra large backpacks, extra tools and knives of course. They paint up rather nicely and the green berets and sleeve insignia make for a nice splash of colour. In terms of size the models are of Warlord Games scale, so slightly bigger and buffer than your usual 28mm models. The thing is though that with Commandos this probably is easier to forgive than with regular units. So maybe mixing those guys with smaller models as regular British army might work just right. 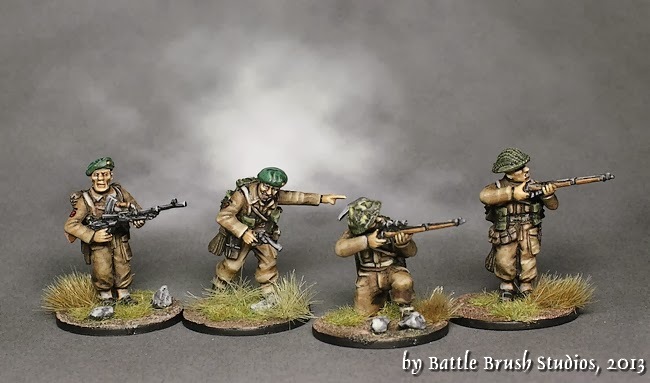 This is an interesting set of models, essentially a recut version of the regular British Infantry. Commandos of course open up a host of options for your WW2 skirmish secnarios, ranging from regular engagements of combat recon to complex narrative scenarios about night time raids and of course with formations with such a legacy as the Commandos have you quickly get into the territory of "wartime action films", pulp themes and so on. In this regard those are a very versatile bunch and you can go wild in terms of equipment as for raids Commandos were especially equipped, far off of the usual organizational and equipment guidelines. 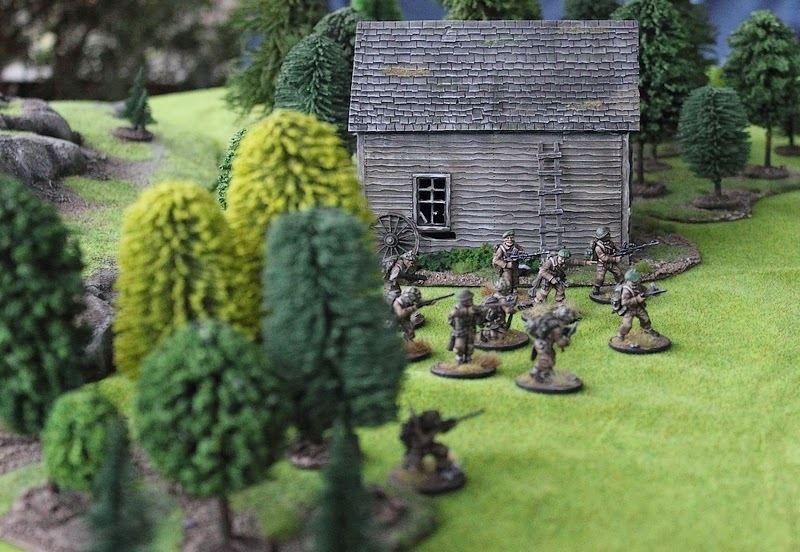 In any case, Commandos (with or without exclamation mark) can add a lot to your games and make for very interesting and different tactical challenges than the usual matchup between allied and axis forces. 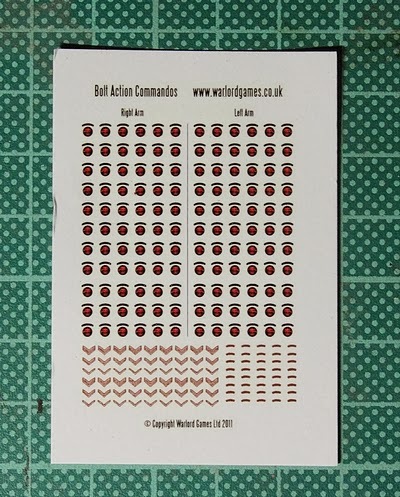 If you want to spice your games up in this way and are into 28mm scale WW2 gaming the Commandos box probably is the most cost efficient way to get yourself a large troop of these fellas. 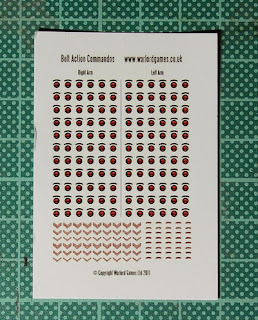 Even if you don't require so many commandos you can build like ten of them to be commandos and the rest as regular British infantry if you like. 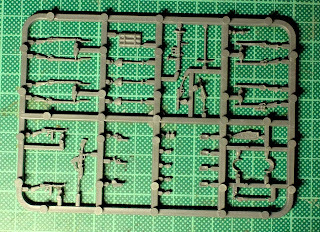 The sprues are almost identical, bar for some head options and the backpacks. However, the thing about Warlord games models remains - they are rather buff and big, everything leans towards "heroic 28mm" scale. 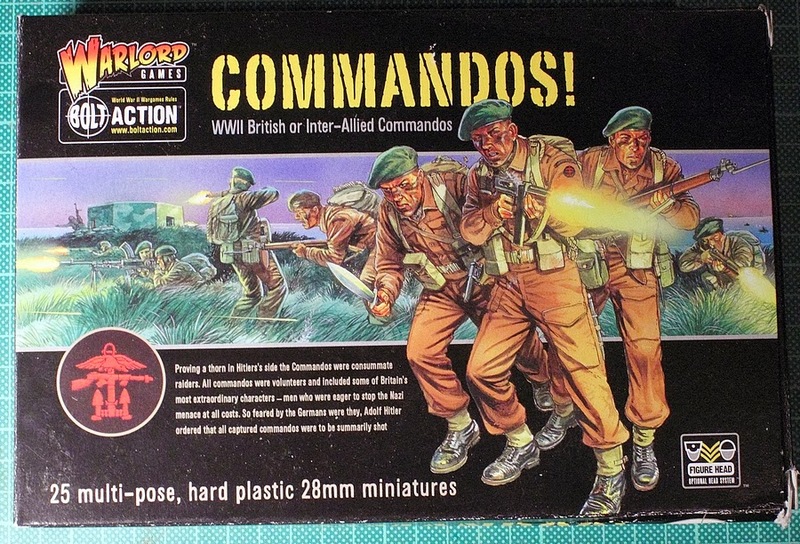 As stated above, this might be less of a problem with Commandos who make sense to be butch fellas but if you just don't like this style this box is not for you. I don't mind it too much. What irks me is the lack of comforter hats. 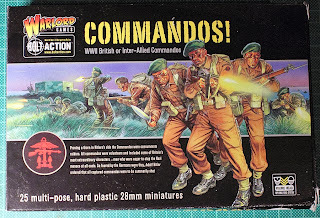 However, a fun box to play around with, all plastic, rather inexpensive, certainly worth a look if you're looking for Commandos. I hope that you enjoyed this review, found it interesting, entertaining and so on. Something positive I hope. If you have any questions, comments or indeed commission enquiries, feel free to let me know via the comments section, the Battle Brush Studios Facebook page or via e-mail. Don't forget that any WW2-themed painting/modelling project commissioned during all of December is -20% off! World War 2 Month at Battle Brush Studios!